On February 11, 1985, Pope St. John Paul II founded the Pontifical Council for Pastoral Assistance to Health Care Workers. Inspired by faith and hope, he intended to offer a response to the challenges arising in the world of health care. 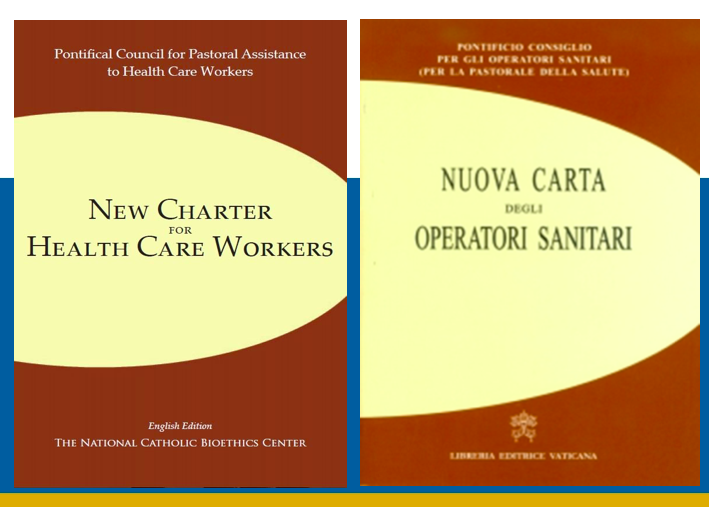 In 1994, the first president of the dicastery, the late Fiorenzo Cardinal Angelini, published the Charter for Health Care Workers, translated into nineteen languages. Following upon new advances in the scientific and biomedical field as well as magisterial pronouncements during the pontificates of Popes St. John Paul II, Benedict XVI, and Francis, the dicastery considered it necessary to revise and update this document while keeping its original structure, focused on the calling of health care workers to be ministers of life. It also addresses problems that are assuming greater importance, especially with regard to justice, as well as respect for and increased sensitivity to the principles of solidarity and subsidiarity in access to available pharmaceuticals and technologies. This is pertinent to the demands of social justice in the field of health care, inspired by the right to the preservation and promotion of health through fair health care policies. It also takes into account an expansion of the personnel involved in this task, so that, besides the traditional health care professionals, others in the world of health care are included: biologists, pharmacists, health care workers in the field, administrators, and legislators in health care matters as well as workers in the public and private sectors who are involved in secular or faith-based initiatives. This vocation, is marked by the anthropological value that the biomedical sciences must promote amid the contemporary cultural trends as well, in their continual search to offer a specific service to the integral good of the life and dignity of every human being and in a fruitful dialogue between biomedicine and the moral principles. This commitment is made by the Church itself with this New Charter which is meant to be an effective tool for confronting the weakening of ethical standards and the subjectivity of consciences which, together with cultural, ethical, and religious pluralism, easily lead to relativism and hence to the risk that we will no longer be able to refer to a shared ethos, especially with regard to the questions pertaining to the meaning of birth, life, and death. The Charter certainly cannot amount to an exhaustive treatment of all the problems and questions but it was produced to offer the clearest possible guidelines for the ethical problems that must be addressed in the world of health care in general.